It’s almost Halloween; and, speaking as a Brit, it was not something I was brought up to celebrate. For us, it falls so close to Bonfire Night it has always been overshadowed by it. For our American cousins, many of whom left the shores of the British Isles, celebrating the failure of a plot to blow up our Government, over 200 hundred years before the mass migration to their new homeland, it’s not surprising that Halloween, rather than Guy Fawkes' failed plot, has become THE occasion to celebrate. The origins of Halloween, also known as Hallowe’en, Allhalloween or All Hallows’ eve, can be traced back to the ancient Celtic festival of Samhain – a festival that took place more than 2,000 years ago. Back then, it marked the end of summer and the harvest and the beginning of winter. Instead of being a more “festive” affair, Halloween celebrated the lives of those who had passed. It wasn’t until the second half of the nineteenth century that Halloween became the more recognisable holiday that has been accepted by the Americans and has growing significance in the UK. Americans borrowed from Irish and English traditions, dressing up in costumes and going from house to house asking for food or money – a practice that eventually became today’s “trick-or-treat”. Now, Halloween is the most popular in the United States where in 2016, Halloween expenditure in the US hit a record $8.4 billion and is expected to rise to $9.1 billion this year! 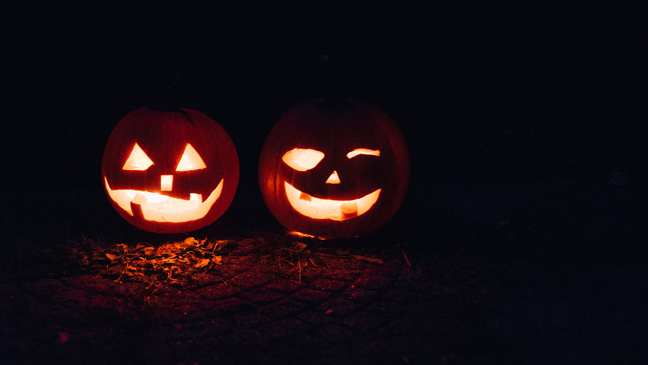 Despite originating in what is now Ireland – part of the United Kingdom – and some elements of the celebration being lost in translation, Halloween is far more popular in the US than the UK – but its popularity in the UK is growing year on year. What we know in general is this; once something goes “big” in the US, it tends to stay that way and then spread across to the UK. Growing numbers of people are decorating their houses with pumpkins and spooky lights, under direct influence of those that have enjoyed this celebration in the US. Well, having travelled through the US, I have a strong appreciation of how something such as Halloween has grown and gradually become relevant to the UK market. And so, perhaps spookily, (ouch!) it is with Marketing Automation adoption. At its conception, Marketing Automation software was a mish mash of email marketing software, website analytics and content management. Today, however, Marketing Automation platforms aspire to be the all-in-one solutions that are capable of driving an entire business’ marketing activity – if configured right! Big players in the Marketing Automation space such as HubSpot, Pardot (by Salesforce), Eloqua and Marketo all started in the US, each one having a significant share of the of the industry space. As of July 28, 2017, according to Statista, in the US HubSpot has a 21.56% market share, followed by Adobe Marketing Cloud with 18.8%, Pardot with 7% and Marketo with 6.17%. In terms of the software adoption lifecycle, the UK lags not far behind the US; where Marketing Automation adoption has crossed the chasm, moved through Early Adoption and is heading towards Early Majority. 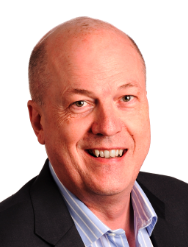 In the UK, both B2B and B2C businesses – are acquiring robust marketing technology stacks, at great speed, to help drive productivity and improve operations. Statistics from The Drum in 2016 indicate that, on average, more than half of B2B companies (55%) are adopting the technology – 11 times more companies with marketing automation than there were in 2011. In a report from Smart Insights, statistics from SimilarTech show that, in 2016, the undisputed market leader, HubSpot, is used by over 4,000 of the top 1M sites worldwide, with Marketo in second. Furthermore, if we look at annual growth statistics from Smart Insights, HubSpot increased its customer base by 51% last year – and continues to grow. 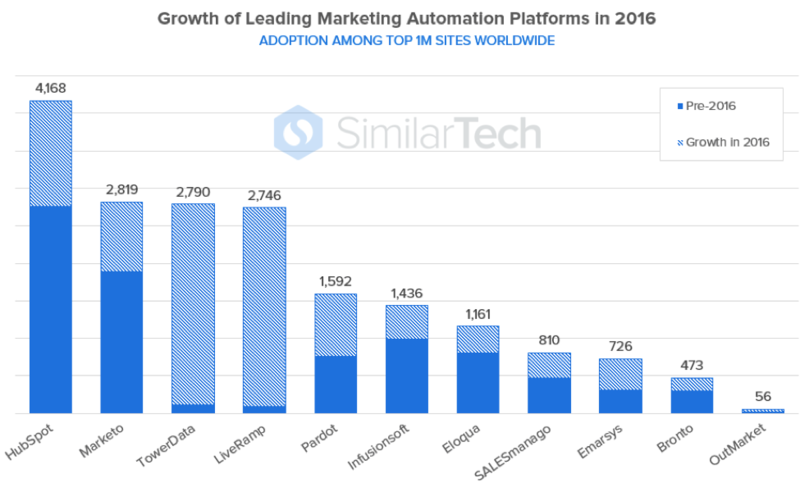 Evidently, the adoption of Marketing Automation is growing rapidly – and new Marketing Automation platforms are entering the market at great pace. Now is probably the time for your start-up or SME to get on board with Marketing Automation and utilise it as a means to scale your business! Tip #34: Don’t be late to the party – join the early majority; adopt and embrace Marketing Automation now. You should be considering using automation to support your business before your competitors do. Rather than spending your budget on a series of isolated and unconnected tools, look at Marketing Automation platforms which bring all of your reporting and access together under one login, rather than several. Use Marketing Automation to help your business and build your marketing productivity.